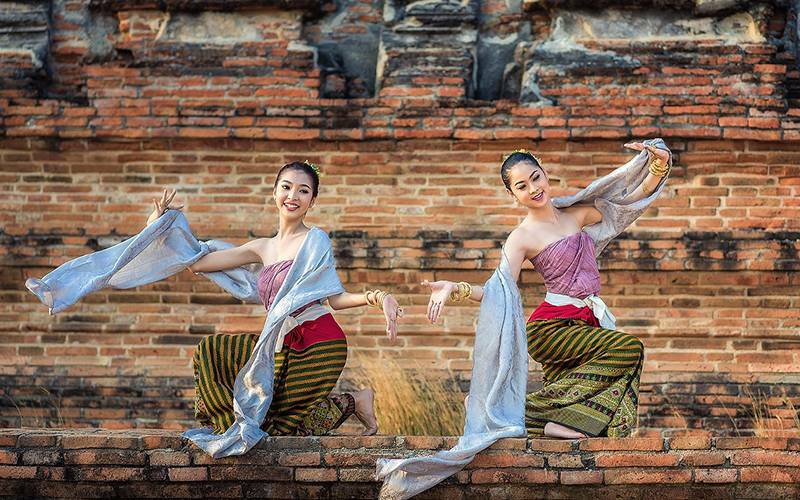 Thai classical music and dance are exceedingly treasured symbols of national inheritance. Thai Classical Music popularly referred to as dontri Thai doem was initially played at court and it was based on Khmer styles. There exist three types of symphonic groups for Thai classical music namely; a percussion-dominated group, Pi Phat, which performs at the court ceremonies and in the theatre; a string-dominated ensemble known as kruang sai, typically heard in indoor instrumental settings; as well as mahori mixed ensemble that often go along with soloists, occasionally in the theatre settings. Thai classical music is also sometimes used as a complement to traditional dance like khon. The music played by the conventional orchestras fundamentally makes use of a scale of seven equidistant tone-steps, though singers and instruments without fixed pitch may occasionally use extra tones. Thai dance is the first theatrical art form of Thailand. Thai classical dance drama includes Khon, Lakhon, and Fawn Thai. Folk dance types include dance theatre forms like Likay, several provincial dances (Ram), the ritual dance Ram Muay, an homage to the teacher dance, Wai Khru. Both Ram Muay and Wai Khru performances precede all traditional Thai boxing bouts. Traditional Thai dancing is a mixture of smooth body movements with extravagant costumes and music. There are a total of six different types of Thai dance namely; khon, ram wong, li-the, shadow puppetry, lakhon and lakhon lek. One of the most distinguishing thing about Thai art form is the outfits worn by the artists. Even though the qualities of the designs have significantly deteriorated since its early stages some centuries back, the costumes remain spectacular and elaborate. Gold and silver sequins in addition to rare adornments like beetle wings have been employed in their making. Khon is Thailand's traditional masked dance. 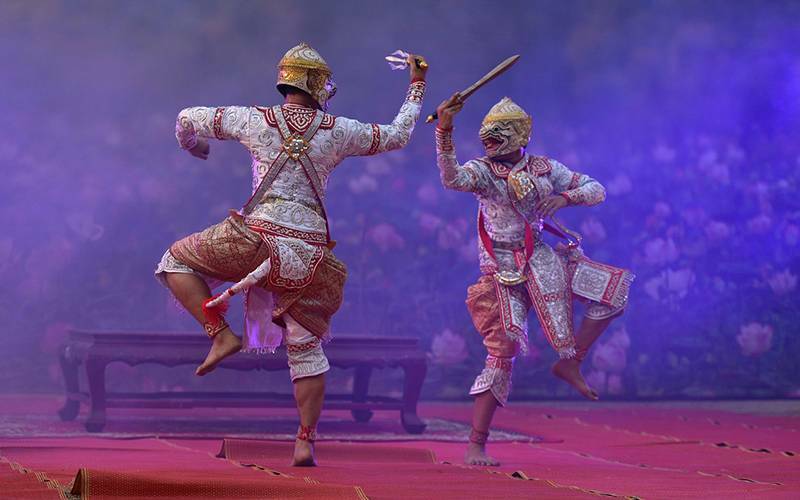 Many years ago, this dance was only performed for the imperial family, but now, it is played outside of the royal courtyard. Nevertheless, it is still considered to be one of the peak art forms in Thailand. The performances are derived from the Thai classic, Ramakien (the Thai variety of the Hindu Ramayana). Troupes of non-speaking dancers perform it while a refrain beside the stage is telling the story. Majority of the dancers are men, and they play some diverse characters like men, women, wizards, and apes. Aside from the masks, these presentations are escorted by narrators and a Thai piphat orchestra, which typically comprises of drumming and wind instruments. Unlike the Kohn style of Thai dance, Lakhon actors are customarily women. Instead of having separate roles in performance, the women work as a unit and perform as a team. Many stories have been told using performances like this through acting, singing, and definitely, dance. 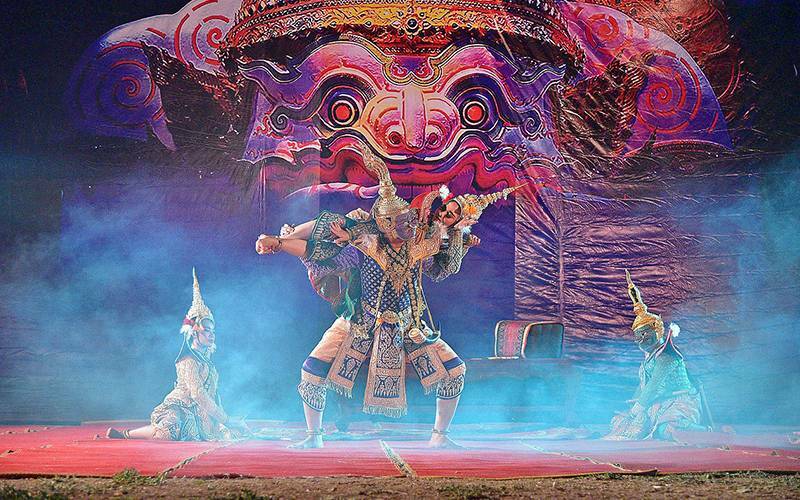 The costumes and stage sceneries are typically much more extravagant in lakhon than in any other types of Thai dance. The lower part of the body does not move as much as the top, with elegant and dynamic hand movements throughout a performance. Li-khe is the most famous dance form in Thailand. These displays are a mixture of several different elements, from extravagant costumes to clowning humour and sexual ambiguity, during a performance. The performance is meant to be amusing, appealing, and above all, it is trendy especially in the villages across Thailand. Ram wong which translates as 'dancing in a circle,' is one of the most prevalent forms of Thai dance. It is a Thai folk dance, and as the name suggests, men and women come together in twosomes and dance in a circle. Though the movements are unhurried and graceful, it is one of the most public forms of dancing out of the six. These performances are becoming an uncommon sight in Thailand. 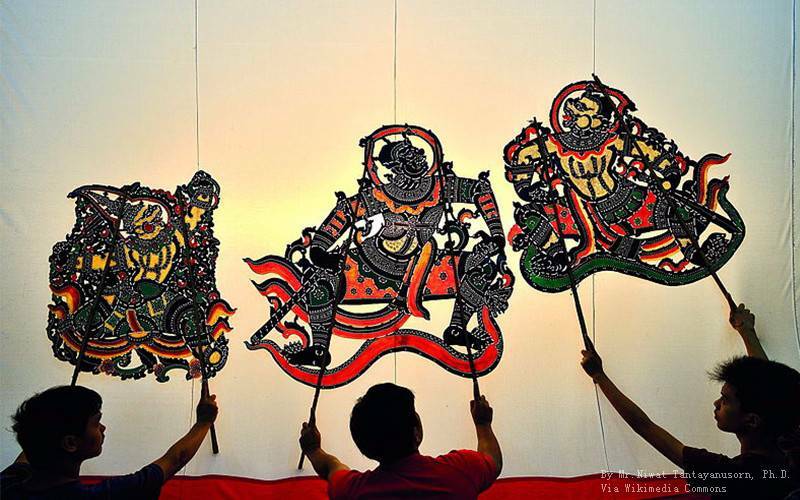 Being one of the country's ancient forms of art, shadow puppetry (or nang thalung) is an exceptional form of Thai dance. This dance takes place behind a white sheet, where someone controls the puppet and is generally go together with music which helps in telling a story. The dolls that are used are made from intricately carved cow hides and painted after the design is complete. Lakhon lek is another form of Thai dance which uses puppet props in the performance. Though this specific art form is hardly practiced, it was sometimes a ubiquitous show. Unlike shadow puppetry, these puppets are genuinely accompanied by real people in the performance. The creatures usually stand at about two feet tall, and they are brought to life by those performing with them. The puppets can do everything the performers are doing, from singing to dancing and so on. Fon is a type of folk dance that goes along with the folk music of the province. The first fon started in the northern province of Thailand. Chao Dararasami of Chiang Mai was the person responsible for its creation and training. Since that time, a variation of fon came into practice, containing the music and style of each province, such as the fon lep fingernail dance from Chiang Mai, fon ngiew from Chiang Rai with the influence of Burmese music and costume. Fon lep (fingernail dance): A northern Thai dance style. Each dancer wears six inch long brass fingernails. The long nails accentuate the finger movement of each dancer. Dancers put on their hair in a chignon-style with a yellow jasmine flower tiara. Fon tian (known as Candle Dance): This is a performance comprising eight dancers, each holding a candle. Dancers are in pairs, one pair to each side. They wear full-length sarongs and jackets with a similar shoulder cloth. This dance is always held in the evening. Likay is much more diverse than lakhon or khon. Stories may be unique and include singing, comedy and ham acting. Costumes may be traditional, modern or a blend of the two. Fon Ngiew (also called Scarf Dance): This is a dance that is performed at a joyful occasion. There is a similarity between the dance and Fon Lep, but it is much faster and fun-filled. Each dancer puts on a yellow flower tiara, jong kra bane, and sabai. 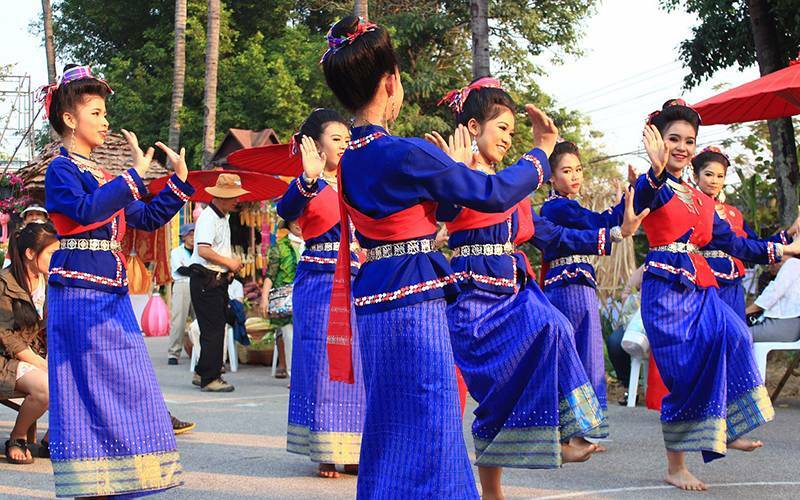 Southern Thailand is famous for Manohra Dance. It is a dance drama which portrays the love story between Prince Suthon and Kinnari Manohra, a half-bird half-woman being. While the prince was away at war, dishonest court counselors deceived the king into believing that the sacrifice by fire of Manohra was the only means to prevent his looming death. There are numerous places to go for traditional Thai dancing and music in Bangkok. 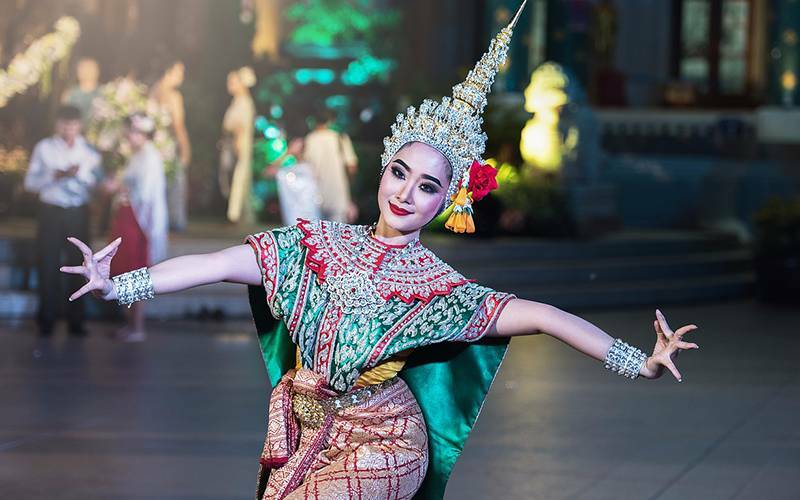 Although Siam Niramit may be the preferred choice for anyone who is mainly interested in seeing traditional Thai dancing, it's a great evening out for anybody who wants lots of variety and fascinating galore. Siam Niramit is a stunning cultural show featuring hundreds of performers, beautiful costumes, elephantsand various styles of dance, music, and many more. It is very tourist centered, but that doesn't mean you won't relish the experience. If you're looking for a cultural show with the wow factor, though, this is a tough one to beat. As a bonus, you can stroll through the replica village before the commencement of the show and dinner-inclusive packages are also available. Apart from the place that has been mentioned earlier, there are other restaurants and theatres like Salathip, Thara Thong, and Riverside Terrace at Anantara Riverside Bangkok Resort that you can visit to enjoy a dance show while you take your dinner. 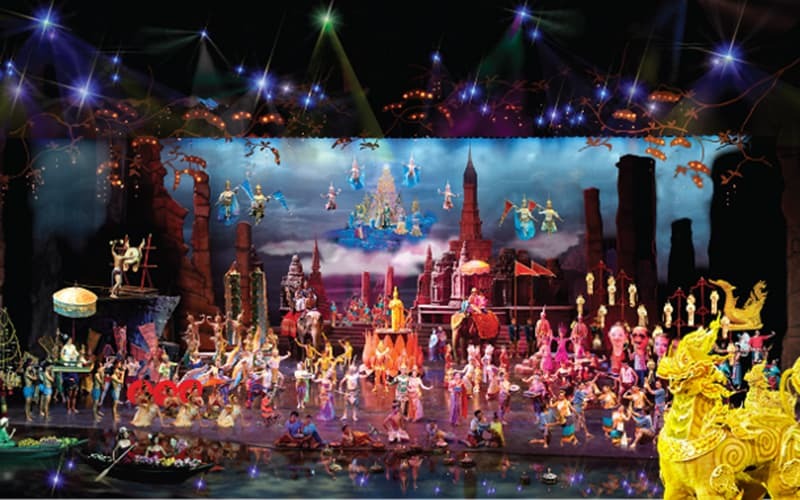 Additionally, there are several prominent performance venues in nearest provinces like Patravadi Theatre in Nonthaburi and Sampran Riverside in Nakhon Pathom, where you can catch a glimpse of great traditional Thai dancing.